Heavenly blog! : No. 1254: Going with God, one always be on the winning side! No. 1254: Going with God, one always be on the winning side! Going with God, one always be on the winning side! 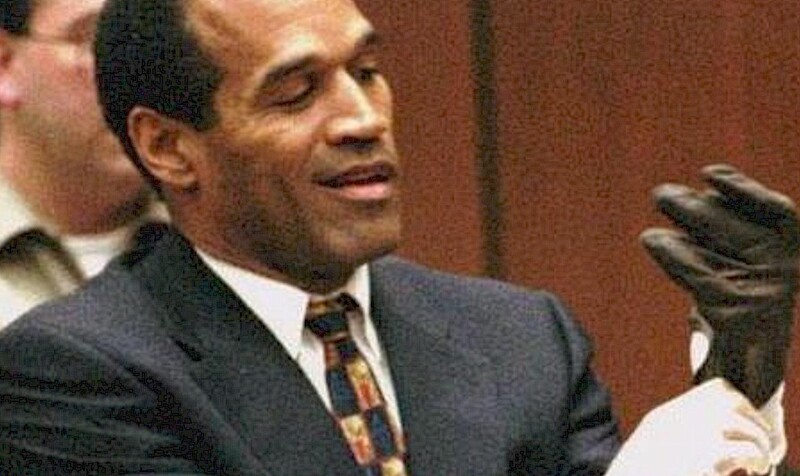 Image of Orenthal James Simpson or O. J. Simpson who by all appearances managed to fool perhaps the best jury? Here, he takes the glove on which he managed to deceive the court with when he took his medicine longer and then swollen hand up. In other words, manipulation Torp Manglerud Polti doing against me is not something unknown for a straight. In the new 7.5 hours long ESPN documentary "O.J . : Made in America" ​​reveals a member of Simpsons defense team how they prepared for the day O.J. should try the gloves in front of the jury and Judge Lance Ito. The gloves used by the gunman was among the police most important physical evidence. One of them was found at the scene, while police investigators discovered the other glove home of Simpson in Brentwood. Both have DNA traces of the victims and Simpson wearing. Therefore, it caused a sensation when murder gloves did not fit O.J.s hands. In "O.J . : Made in America" ​​tells one of the defense lawyers that several weeks before the session had been Simpson to stop taking arthritis medication. This would automatically cause the Simpsons hands swelled up, and guarantee that the gloves did not fit. Jan Aage Torp fits perfectly into the same role in which he, police manipulated judge Malin Strømberg Amble and her two fellow judges with their liars, distortion and manipulation. And that Malin Strømberg Amble even did in my estimation a lousy job when she brought the pitch to me or Brynjar Meling what she was going to build with the ruling. It was the crowd, but here are two factors that make all judgment is erroneous! 1. 99% of what is written against Jan Aage Torp written by his fictional review. 2. What Torp "poodles" and "lackeys", not least the two largest networks roll has written in quantity and verbal words and expressions surpasses me a thousand times. 3. Of course this is nothing but an outright miscarriage of justice if this judgment will be upheld. But God knows, it keeps galore! Should not also in Jan Aage Torp ready to fool such a low standing straight and jury as we have here in Norway with the same method? Of course, what we are seeing now is nothing new in the history of the innocent go free and the innocent are caught. Room. 8 28 And we know that all things work together for good that love God, to them who, according to his advice is called. Psalm 119. 90 From generation to generation thy faithfulness; you established the earth, and it abides. 91 To perform your judgments they stand this day, for all things are your servants. "Christensen back to embark prosecuting power Appeals write and to repeat his many lies that Torp has written more against him than Christensen has written against Torp." 1 Genesis 3 1 Now the serpent was more subtle than any beast of the field which the Lord God had made, and it said to the woman, Yea, hath God said, Ye shall not eat of every tree of the garden? 2 And the woman said unto the serpent, We may eat of the fruit of the trees of the garden; 3 But of the fruit of the tree which is in the midst of the garden, God hath said, Ye shall not eat of it and not touch it, lest ye die. 4 And the serpent said unto the woman, Ye shall not surely die; 5 for God knows that in the day ye eat thereof, then your eyes shall be opened, and ye shall be as gods, knowing good and evil. Note that Kjell Andersen doing the same as Satan. Citing not correct what I write, but almost. With the result that everything is a lie what I say. I never said that Jan Aage Torp has written more than me, but his lackeys and "poodles" has written far more hatmeldigner against me than what I have written. I have not written a hate speech, but I have revealed Torp as a psychopath and a mockery apostle. But what they have attacked me, have been cheesy, ugly and obviously hate speech when it also goes to my family. But Torp has purely verbal words and expressions gone much longer than me. Then not Andersen had to quote on memory something other than what Satan did in the Garden of Eden when he quoted something of what God had said, but distorted. With it to follow that Eve was deceived or tricked into eating the fruit! 99% of Torp written by his false accusations against me! After what appears from the judgment in the District Court, it was not what I had written and spoken who were "punishable", but the crowd. Then this is also one of Satan's lies when Torp Reviewed me was what we have written about Jan Aage Torp only 1% of it was when written. And 0% of what is out there on Youtube regarding Torp, is spoken by his fictional review of me and the Heavenly blog. In other words, the entire case and the verdict against me is nothing more than a cabal and fabricated! When one experiences like this that the evil inserts, what then? Of course this is boring and not so one would like to have it. But as a believer can we go to God with this and what scripture says? This is for us what is good, we will come out stronger. How? We do not know, but God's words and promises of God saying this, already quoted, I take with promises again. All things are our servants as David and Paul says that all things work together for our good! In other words, everything that we as believers reaches of situations and events, is a win win situation! For us as Christians is never a loss win or win loss or loss loss situation. Only win win situations when the word of God says that all things are our servants, and everything will work together for our good! The glory and bigger and better than this can not be said! Notice this: "His divine power has granted to us everything pertaining to life and godliness, which he has given us the greatest and precious promises: that by these ye might be partakers of the divine nature,"
This is probably something of the strongest and most delightful as is stated philosophy of some people? We have received divine nature and had the world's best and precious promises. In other words, it can not be and be better off than it is with those who belong to God and have faith in Jesus. Our participation in what God has done for us in Jesus Christ is so perfect that it is not possible to get better out of it all! In other words, what I'm going through. And what others have gone through and are going to go through. It is and remains only one thing, as long as we are stuck in Christ Jesus and preserved by faith in him, that we are more than overcomers scripture says! Room. 8. 37 But in all these things we are more than conquerors through him who loved us. We stand firm in Christ, then we as believers in every situation victory, one thing we should do is to be preserved in the faith. It's just enough, God requires no more of us! No. 1243: Jan Aage Torp is no Christian!